Doty & Sons manufactures concrete benches with recycled plastic lumber. Item B4151 is 5 foot long, 2 concrete legs, recycled plastic lumber back and seat with stainless steel hardware. The benches are great for recognizing individuals or groups, remembering loved ones (memorial benches) or class gifts. Recently a Boy Scout, Colin Good, came to us about his Eagle project. We worked with him so he could purchase three Buddy Benches for a local school. Colin organized the project which include installing concrete block and the benches. An article about the project recently ran in the local newspaper. This article appeared in The DeKalb Daily Chronicle is copied here. Collin Good, a Boy Scout from Troop 2810 chartered out of Sycamore Lutheran Church, recently completed his Eagle project. 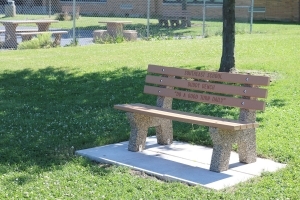 He installed three Buddy Benches at his former school, Southeast Elementary in Sycamore. 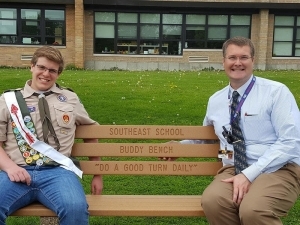 The idea of the Buddy Benches began in Pennsylvania in 2013 when a first-grader thought it would be a great concept and sold his school and community on it. Since then, many other schools across the U.S. have adopted the idea. The benches create a kinder playground culture by having a place for kids to sit if they don’t know what to do on the playground, are new to the school, or are just afraid to ask to join a game or group of kids. When other students see a child sitting on the bench, they should invite the child to join their group or sit down and get to know the child. It combats bullying and playground loneliness, and promotes awareness of the needs of others. Good began his project by presenting the idea to Southeast Principal Mark Ekstrom, who was excited about the concept and asked for three benches, one for each playground. At Ekstrom’s request, Good helped co-chair the school’s fall pie fundraiser, which is used each year for playground improvement. His responsibilities included creating a flier about the benches to hand out with the pie order forms, counting pie orders, unloading the delivery truck and sorting customer orders, delivering pies and thanking each customer personally for helping support his project. The next phase of the project took place in the spring. Good and Ekstrom finalized their choices and ordered the benches from Doty and Sons. The Doty family has strong ties with Southeast School and provided a generous discount on the benches. 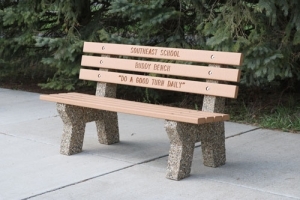 The three back slats on each bench are engraved with the words “Southeast School,” “Buddy Bench,” and “Do a Good Turn Daily,” which both explains the purpose of the benches and is the motto of scouting. A few weeks later, Good organized volunteers to prepare the ground for each bench to be installed. This involved digging, adding sand and leveling and placing the concrete pavers for the benches to sit on. The benches were then assembled and bolted down. The final piece of the project was to provide the students with education about the benches. Good and several other scouts shared a PowerPoint presentation and acted out several skits to demonstrate how to use the benches.